Up to 150 inches of snow has fallen over the winter at Big Bear this season and more is expected this week. Up to 150 inches of snow has fallen over the winter at Big Bear. Big Bear Snow Play is projected to remain open daily from 10 a.m. to 4 p.m. daily through Easter. General admission passes are $35 for snow tubing participants at least 36 inches tall. 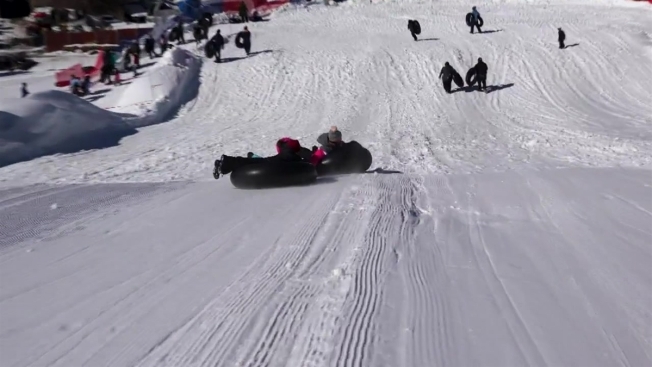 Spring breakers are expected to flock to Big Bear Snow Play for a week of fun at Southern California's largest snow-tubing park. "We have a solid snow base and conditions are outstanding right now. It's the perfect opportunity to escape textbooks and homework for awhile," said Big Bear Snow Play Director of Operations Scott Voigt. The surface conditions are machine groomed nightly for a fast-paced downhill fun. The snow-tubing park offers two Magic Carpet uphill lifts that give easy access to the top of the slopes on moving conveyor-belt transporters. The park even expanded its glow-tubing night sessions for people to play in red, blue and green colored lights in the snow at night. Glow tubing is also available every night from 5 p.m. to 9 p.m.
With the amount of snowfall, Big Bear Snow Play is projected to remain open daily from 10 a.m. to 4 p.m. through Easter. General admission passes are $35. Small children, 36 to 42 inches tall, get in for $20 with a paying adult. For more information check out Big Bear Snow Play here.